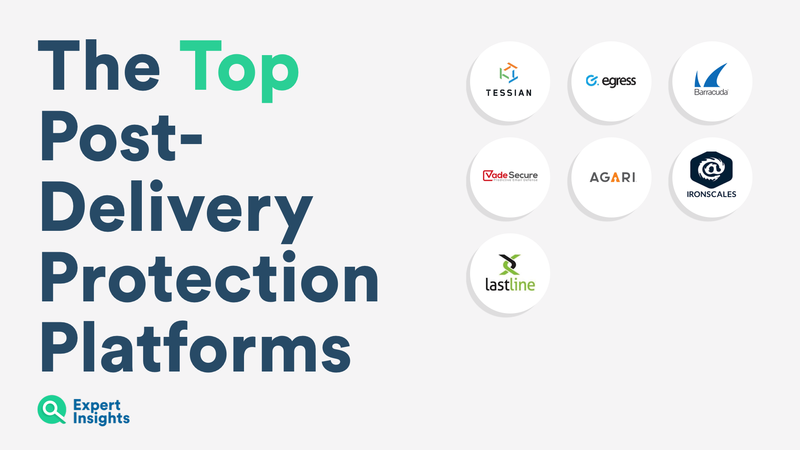 Discover the top Post-Delivery Protection Platforms for Email. Examine their features, threat protection and adaptiveness. Artifical Intelligence (AI) and Machine Learning (ML) Email Security are crucial to protect your business from attacks. These Post-Delivery Protection platforms are on the leading edge of email security. They work within your inbox, and protect you against threats that make it through your Email Secure Gateway. Artificial intelligence and machine learning power these platforms. This allows them to get to know your organisation’s unique communication habits, and protect you from multiple threats. Outbound Email Security tools use this knowledge to stop you sending emails to the wrong person. They also prevent data loss and harmful leaking of information. Post-Delivery Protection platforms secure businesses against phishing attacks and Business Email Compromise from within the inbox. These platforms are all additional layers of security to increase your existing email security. Tessian is our market leading Outbound Email Security platform. It uses advanced machine learning algorithms to protect your business against a range of email threats. Tessian scans your emails, leaning your communication habits. This allows it to see when security issues arise. Four key modules make up this service. Firstly, Guardian, which identifies when you have misaddressed an email and stops it from being sent. Secondly Enforcer, which protects information from a leak. Thirdly, Constructor, which allows you to install custom security policies. And lastly, Defender, which identifies and block spear phishing attacks. Tessian provides full auditing of all threats. The service learns your inbox and is installed in just 24 hours. It also works with all existing platforms. Tessian is an extremely powerful tool to have in your network. It offers great protection against spear phishing and leaking. It’s extremely effective at preventing data loss and stopping phishing attempts. We recommend them especially to those in legal and financial markets. You can read our full review of Tessian here. Egress Threat Protection has a focus on helping to stop emails unintentionally sent to the wrong person. It’s powered by machine learning algorithms hosted in the cloud. This means it integrates well with all existing platforms. This platform learns your email communications, then based on a range of factors can tell when you’re sending an email to the wrong person. For example, a CEO may not wish to send spending reports to someone in Customer Service. Doing so could cause confidential information to become leaked. Egress protects against this by knowing that the CEO wouldn’t mean to send this email to that individual, and would alert them before they hit send. This technology improves over time, so the better it gets to know your network, the better it will work. Egress also provides audits, which show how many users are making mistakes, and if they are ignoring the warnings and sending emails anyway. Egress will greatly reduce the risks of leaks in your organisation, by stopping people from sending email to the wrong person. You can read our full review of Egress Threat Protection here. Barracuda Sentinel is a cloud-based AI email security service powered by artificial intelligence. It works within the inbox to protect your organisation from phishing attacks, business email compromise and malicious URLs. Sentinel is extremely strong at blocking threats. Based on your company’s communication habits, it can tell when someone is being impersonated. This prevents Business Email Compromise. The AI grows stronger over time, meaning that you gain greater protection as you send and receive more emails. Barracuda also offers a way to easily report phishing emails which do make it into inboxes. This helps to improve the service. The Sentinel platform also prevents web impersonation and inbound spoofing, which is another good way to improve your security. This service is very popular with customers, and we highly recommend it to customers looking to improve their security. You can read our full review of Barracuda Sentinel here. Ironscales combines human intelligence with machine learning to block phishing attempts from the inbox. It has a focus on Business Email Compromise and Spear phishing. The platform learns your company’s communications and blocks security threats. This service offers strong protection against email threats. The service is augmented by human intelligence teams which fine-tune the service to make sure it’s always working as intended. As it works automatically, this is a great service to take the pressure off IT departments and increase overall security. It installs easily and works immediately to protect your business. Ironscales is popular with clients for its high-quality customer support. We’d recommend Ironscales if you need advanced threat protection. You can read our full review of Ironscales here. Vade Secure is a powerful threat protection service for O365. Their AI is made up of data set which is informed by over 500 million mailboxes across the world. This means it offers extremely strong and effective protection against both known and new zero-day email threats. This platform is a great option if you are looking for the strongest spear phishing protection. It’s very simple to deploy and offers real-time email scanning from within the inbox. This makes it a great choice if you have an email security platform protecting 0365 already, but need stronger protection. The service learns automatically but is a human support team also helps to improve it. This decreases the chance of false positives and increases the all-around efficiency of the service. Vade Secure is a powerful threat protection tool, which we’d recommend if you need strong protection from phishing attacks. You can read our full review of Vade Secure here. LastLine Email Defender has a focus on protecting your organisation from email threats. These include ransomware, business email compromise, and other social engineering attacks. The service offers strong AI powered threat detection, which identifies if an email is genuine, or a phishing attack. This is much more accurate than the protection offered by traditional email gateways, and so offers much stronger protection. One of the key strengths of this service is how well it can protect against Business Email Compromise. The service can identify when an account has been taken over, and block it from further damage. The service offers comprehensive protection because it scans all incoming, outgoing and internal email communications, looking for threats. This service is popular with clients for its flexible deployment. It works with G-Suite, O365 and even on-premise Exchange. This makes it a good option for larger companies who need advanced threat protection which fits their existing structure. You can read our full review of Lastline Email Defender here. Agari is a very strong advanced threat protection platform. It offers businesses a high level of Spear Phishing protection. Agari’s artificial intelligence systems learns legitimate sending behaviours within a company and can therefore spot when a phishing attack is taking place. Agari also offers businesses strong defence against business email compromise. The platform inspects all incoming email communications, analysing human relationships and behaviours. By understanding this, Agari can spot when someone is being impersonated, and prevent Business Email Compromise attacks from taking place. Agari as a company has a big focus on innovation. They have a data driven approach to social engineering styled attacks, which helps to more accurately predict and prevent social engineering styled attacks. This makes them a powerful tool for protecting your business against phishing and business email compromise attacks. You can read our full review of Agari here. So there ends our list of the top 7 AI email security platforms for businesses. Finding the one that best suits your business is crucial to improve your security.